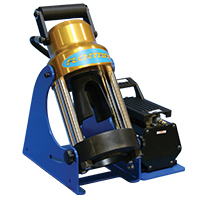 versatile and cost effective crimping machine with its ability to crimp hoses thru 1” 6-Spiral. The FX17A is supplied with a 10,000 PSI air over hydraulic pump. The FX17H is supplied with a 10,000 PSI hand over hydraulic pump. The FX17 requires FX17 Series crimp dies and spacer rings.